Facebook has come a long way since its creation in 2004, not just in terms of who uses it but also how it’s used. And because of the site’s continued evolution, it has become more accessible for users and businesses alike. While some of the site’s changes may have a negative effect on advertisers, such as the recent change to its algorithm, others are designed to help businesses reach audiences more effectively. From the new profile layout to on-site contact forms for paid ads, Facebook can help you reach your marketing goals, if you take advantage of and utilize these features properly. One way to accomplish this is through paid Facebook advertising. 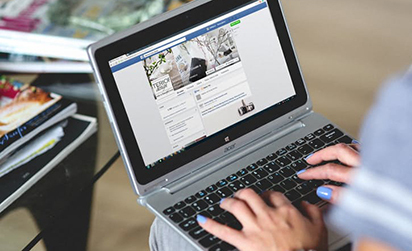 To give you a better insight into the increasing significance of Facebook advertising, here are a few things you should know, including common mistakes and ways you can improve your ads. Compared to traditional PPC marketing, Facebook ads can drive just as much traffic and leads to your site with a lower Cost-Per-Click (CPC) and Cost-Per-Lead (CPL). Although successful, Facebook should in no way be used as a replacement for traditional paid advertising, but can be a great complementary addition or even alternative option for those who can’t afford the highly competitive PPC arena. Paid Facebook is best for first points of contact and brand recognition. It gets your name, brand and program in the eye of your target audiences and encourages them to learn more. This form of marketing is ideal for small budgets and works well with other efforts to help you accomplish your goals. If you are B2C, such as a college or university, you can expect to find your target audience easily accessible on Facebook whereas a B2B, such as a company that sells bulk copy paper to universities, might have less luck. Facebook is a consumer-rich medium, so logically it’s an easier sell for B2Cs. This doesn’t mean that B2Bs can’t reach their audience, they can. It just means that it will be a little more difficult. With a B2B, your ability to reach your target audience may be contingent on the amount of information people include on their Facebook profiles. If more information is included on the profile, it will be easier for you reach your audience through targeting. Understanding your audience is also essential when creating your ads, especially regarding mobile and desktop. Did you know that 44 percent of Facebook users under age 35 only access Facebook via mobile devices? This knowledge is invaluable as you create your ads, as you’ll learn later, but this is just one example of how important it is to understand your audience. For a useful way to evaluate your audience, use Facebook’s Audience Insight Tool. Yet another reason to make sure you understand your audience is so you can properly target your ads. One major feature of Facebook advertising is the ability to better target your ads so that they will reach your audience and result in more relevant leads. While you have the ability to target ads in traditional PPC advertising, you can’t get nearly as specific as you can with paid Facebook. A common mistake advertisers tend to make with Facebook ads is to try and target the broadest audience possible. By being more precise and specific in your targeting, you are more likely to gain the quality leads you are looking for. For example, imagine you are a university that wants to improve enrollment for your graduate programs; you wouldn’t target people 17+ who have a minimum education level of a high school diploma. Instead, you would want to target those 25+ who have at least a bachelor’s degree. To get even more precise, you may also segment your audience by interests relevant to your specific program (i.e., an EMBA program targeting those interested in business, entrepreneurship, etc.). Another unique aspect of paid Facebook advertising is the ability to create ads based on your campaign objective. Facebook divides these into three main objectives – awareness, consideration, and conversions – then allows you to choose from subcategories beneath each. Determining your campaign objective not only helps with your marketing plan, but also allows you to choose a Facebook ad structure designed to help you better accomplish your objective. Similar to a traditional PPC ad on Google or Bing, a paid Facebook click ad allows you to drive people to your site, whether it be a specific page on your site or a predetermined landing page. A lead ad, on the other hand, now allows you to collect a person’s contact info right there in Facebook. In 2015, Facebook introduced the new feature, which allows users to fill out a contact form without ever leaving the social site. I’ll get into the lead forms a little later, but once the form is complete, Facebook also gives users the option of visiting a page on your site. Working on numerous paid Facebook campaigns, I’ve seen the success of both lead and click campaigns. The on-site lead forms make it easier for users to fill out their information and for businesses to gather information. Click campaigns, on the other hand, work similarly to Google and Bing ads, driving people to your website and providing them with additional information where they can contact you, giving you even more relevant leads. With Facebook including on-site lead forms, it became that much easier for users to fill out a contact form, all without having to leave the site. 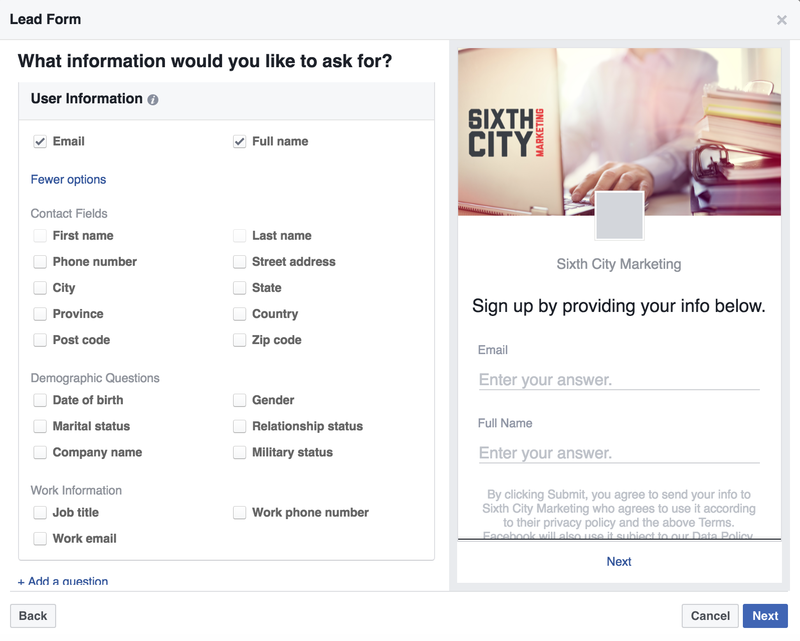 Facebook now allows you to create and customize your own lead form within its system. You can choose from both predetermined fields, including contact fields, demographic questions, and work information, and even create your own custom questions/fields. While this has made it easier to collect contact information from potential students/customers, some marketers worry that it is almost too easy. With just a few clicks, users can send over their contact information without really even understanding it. This not only creates issues with users, but marketers as well. It can affect the relevancy of incoming leads. To combat this, I recommend including a context card when creating your lead forms. The context card is an info card that appears prior to the actual contact form, letting the user know what he or she will be getting as a result of providing his or her contact info. This will allow you to provide more information to the user and give them a better idea of what they are signing up for. As with any ad, you want to make sure you include copy that is relevant, interesting and enticing to your target audience. To do this, you can easily follow the classic copywriting formula AIDA. Action – lead users toward taking an action, whether it be contacting you or purchasing/applying, through a call to action. 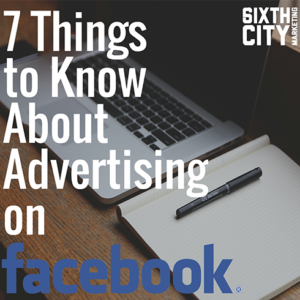 Remember, the structure for Facebook ads varies slightly from what you may be used to with other paid ads. In this format, you have three opportunities for ad copy: the text at the top of the ad, the headline, and the link description. Unlike PPC, Facebook ads don’t have strict character limits. There are certain recommendations, however, to ensure that the ad is accessible in both mobile and desktop formats. These text length limits are recommended based on the number of characters of ad copy that could be displayed on smaller screens. If you want to ensure the largest number of people within your target audience sees your ad, make sure you follow these guidelines. There’s one more copy element you should take into consideration when creating your Facebook ads: the call to action. One of my favorite things about Facebook advertising is the copy options. From the headline and text to the call to action, there are some great opportunities to get your audience’s attention. Just make sure you do it strategically. Like with any type of marketing, it’s important to know what does and doesn’t work so that you can focus your money and efforts on what yields the best results. For some types of digital marketing, this mostly rings true for the copy in the ad, but for Facebook advertising, the images and videos in your ad are more important. Think of your image or video (that’s right, Facebook gives you the option of either) as the first point of contact for a potential student or customer. It draws them in, making them want to learn more. Then your copy serves as the second point of contact, giving them additional information which directs them to your site or to a contact form. 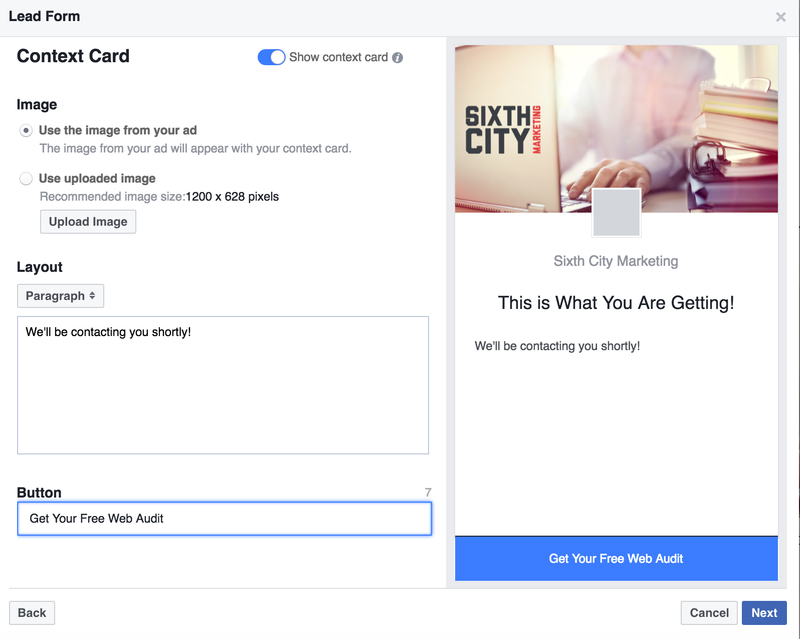 Since the image in your Facebook ad plays the most important role, it makes it all the more essential that you test several images to see what works best. Try to avoid generic stock images or anything you don’t have the rights to. Also, avoid using your logo. Images of people have been found to work best, especially ones of people who resemble your target audience.For instance, if you are trying to recruit students for your EMBA program, you wouldn’t want to use photos of fresh-faced 18-year-olds for your ads, even if the image itself is pleasant. Testing your images/videos will help you figure out what works best so you can focus your budget on the better performing ads. Try different images of students doing a variety of things (attending class, laughing with peers, speaking with a professor) and maybe try an ad or two using images of campus. One last thing to know about images is that Facebook limits the amount of text you can have in a photo. Previously, the social site wouldn’t approve an ad if 20 percent of an image’s area was text. Facebook recently modified its policy allowing photos that would have previously been rejected to run; however, ads with higher amounts of text will either receive less or no delivery. Paid Facebook can be a great addition to any marketing plan. It can help you better reach your target audience, improve traffic and leads to your site, and is a cost effective tactic that can complement your digital marketing. 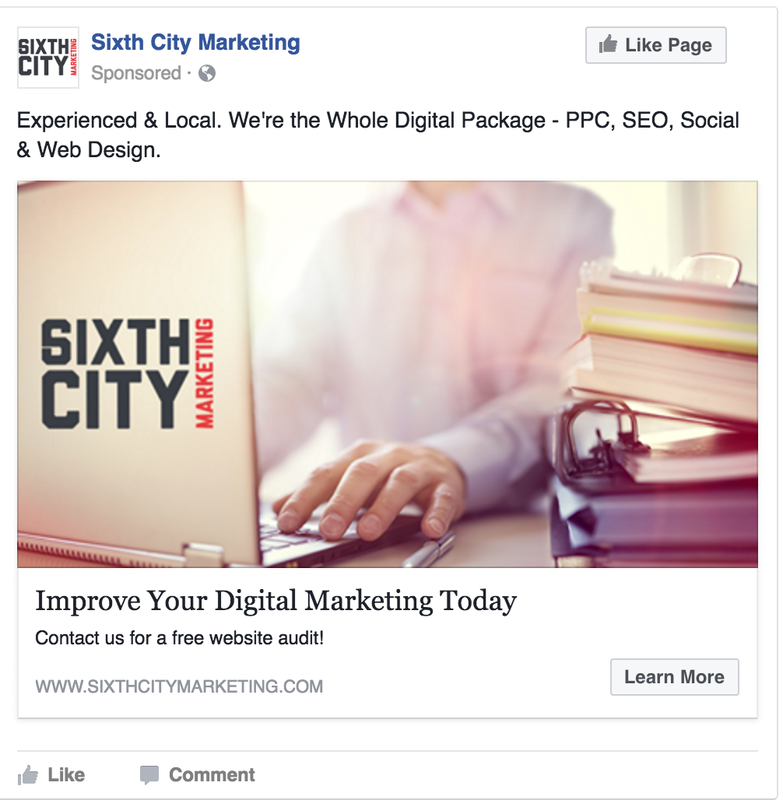 If you would like to learn more about how paid Facebook ads can help you increase enrollment, brand recognition, and inquiries, contact Sixth City Marketing today.